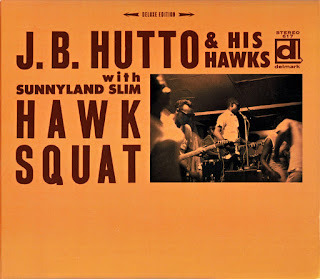 This generous reissue of J.B. Hutto’s 1968 Hawk Squat is a celebration electric blues, capturing one of Chicago’s more influential, if not lesser known, blues artists at the height of his creative power. In the mid-‘50s, Hutto recorded a handful of sides for the local Chance label, mixing a raw electric sound with the rural country blues he grew up listening to in 1930s Georgia. Combining a crackling, stinging guitar attack with impassioned vocals, Hutto’s music was raw and smoldering, the antithesis of contemporaries like B.B. King. And while B.B. King played the elegant Regal Theatre, J.B. Hutto was playing shot-and-a-beer joints on Chicago's rough and tumble South Side. By the time label boss Bob Koester had tracked J.B. down at Turner’s Blues Lounge at 39th and Indiana, Hutto was fronting the toughest, most exciting blues band in Chicago. For two years after first meeting Hutto, Koester waited for the opportunity to capture the blistering, raucous sounds he had heard J.B. and the Hawks lay down at Turners. Koester and his recording machines first captured Hutto at the Mother Blues club in 1966, and again in 1968, this time in a proper recording studio. Featuring a crew of Chicago's finest, including Sunnyland Slim, Dave Myers and Frank Kirkland, Hutto leads the band through a dozen slashing, stinging tunes with élan -- songs that undoubtedly represent the hot ’n’ sweaty, pulsing atmosphere of South Side clubs like Turner’s and The Checkerboard. In addition to the obvious energy and excitement displayed in Hutto’s guitar work, Sunnyland Slim’s presence, on organ and piano, is a noteworthy treat indeed. His swirling Wurli weaves and flows around Hutto’s fulminating guitar playing and provides the bedrock around which the band maneuvers. This lavish reissue includes the original release with running order intact as well as five alternate takes and a new cut. Every track, from the first strains of “Speak My Mind” to the namesake “Hawk Squat” is testament to Hutto’s musical conviction. Standout tracks include “Too Much Pride” featuring Sunnyland on acoustic piano and jazzman (and Jazz Record Mart employee) Maurice McIntyre on tenor sax. It’s a heartfelt song, Hutto’s vocals being particularly moving. “What Can You Get Outside That You Can’t Get At Home” showcases second guitarist Lee Jackson as he whips out some scorching straight lead lines that belie the bands rough hewn street smarts. “20% Alcohol” is a bouncing musical sermon about the ravages of fortified wine, peppered with Hutto’s inventive slide guitar stabs and barroom preaching. Hawk Squat was clearly recorded with no over dubs or fancy processing; it’s about as raw and honest as a recording gets. That truthfulness and immediacy is evident in the performances as well. 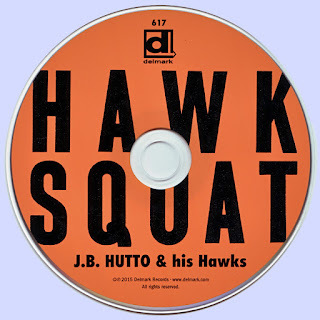 His exuberant smile and demeanor are integral to the music on Hawk Squat, and are documented beautifully in the ample booklet included with the CD; clearly J.B.’s joy and and musical sincerity are obvious throughout Hawk Squat. It bears mention that Delmark’s packaging and presentation of this CD reissue is first class in every way. It is both a literary and visual home-run. Although J.B. Hutto never received the riches or fame in his lifetime that were afforded others, he did leave a legacy that will survive for generations. Rock artists like Jack White cite him as a major influence while his living legacy, Lil’ Ed Williams, has been purveying J.B.’s craft for 30 years with his band The Blues Imperials, introducing fresh audiences to J.B. Hutto through Ed’s uncanny ability to channel his Uncle J.B., right down to the ever-present smile and trademark fez. Dave Weld, who was mentored by Hutto at the same time as Lil’ Ed, also carries the torch for this rowdy style of blues with his band The Imperial Flames. 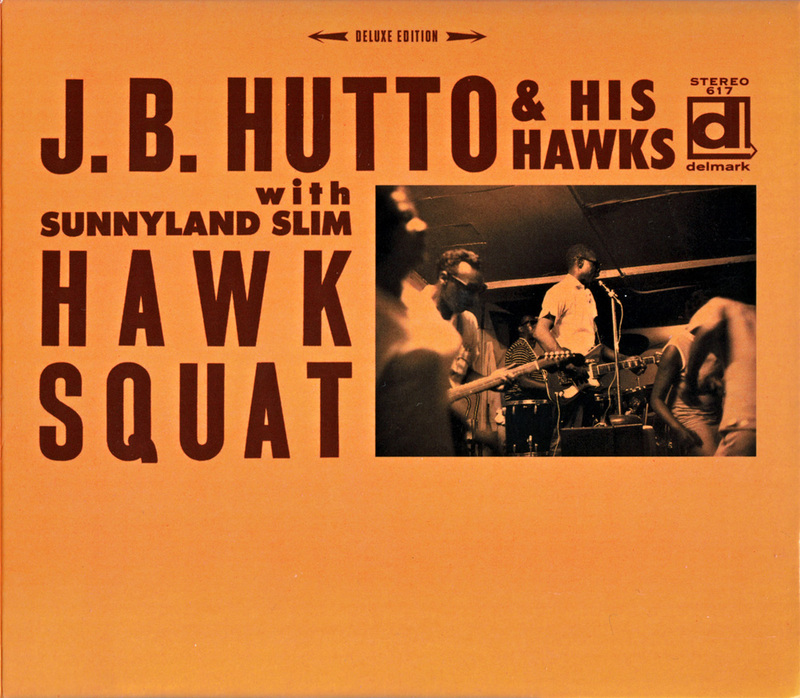 The years following the release of Hawk Squat saw Hutto carry on his residency at Turner’s, become a fixture of the famed Maxwell Street scene, take over for Hound Dog Taylor in the Houserockers after Taylor’s passing, and eventually landing in Boston with a band he coined “The New Hawks”. Though he recorded several albums for the Varrick label during that time, none are as fully realized and enduring as this 1968 Delmark release. Like Junior Well’s Hoodoo Man Blues and South Side Blues Party before it, Delmark has made a rarified classic even more compelling. What was already regarded as a masterful performance is now augmented by alternate performances, a new song, dozens of period photographs and first hand testimonials to the time and place Hawk Squat was crafted. It is hard to imagine a recording more indispensable for the serious blues collection.